After waking up around 8:15 AM going downstairs for breakfast, I went back to my room and arranged my gear before grabbing a quick shower down the hall. Then I left for Centraal Station to deposit my bag for the day so I could tour Amsterdam. Amsterdam is a stunning city and probably one of the more interesting places that I have ever visited because of its beauty and uniqueness. First I took a 1 1/4 hours tour of the city’s canals by a glass-covered canal cruiser. Although the sky was overcast, we passed cobbled streets, beautiful old churches, racks of bicycles and a number of smaller canals. The multilingual audio tour gave me a great orientation to the city. Then I decided to walk the streets of the old city. I came first to the Nationaal Monument, a colossal white pillar which is the World War II Memorial to the Dutch war dead. It’s located in the busy Dam Square. 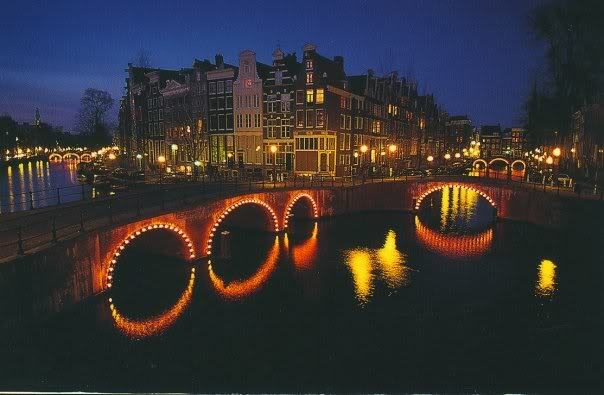 The Dam Square is the original location of the dam in the River Amstel. On the west end of the square is the neoclassical Royal Palace, which served as the city hall from 1655 until its conversion to a royal residence. Next to it is the 15th-century Gothic Nieuwe Kerk (New Church). I still can’t get over all the people riding bicycles up and down the canal line streets. This is truly a cycling nation! I then went to visit the Anne Frank house, the home of the Jewish teenager and her family who hid from the SS before being caught and sent to Nazi concentration camps. I even saw the bookcase stairway where they hid from the Nazis for more than two years. The exhibits were very heart-wrenching because of the reality that it depicted of a time that will never be forgotten. A museum also paid homage to other Dutch Holocaust victims. Overall, the Anne Frank story came alive and was very rewarding and definitely worth the five guilders. I then took a longer walk around this part of the city before going back to the train station for the second time to withdraw some more guilders. I had a late lunch at a place Lonely Planet recommended called the Pancake Bakery. The food was terrific as pancakes are a national food of which they have hundreds of styles. I had a hot chocolate and a pancake that was the size of a lunch plate called Brazilian style. It was covered in whipped cream, amaretto, pecan ice cream, caramel sauce and a light chocolate sauce and powdered sugar. They claim to have the best pancakes in Europe. I could not argue with their claim because they were the best I have ever had. I then took a tram to other parts of the city and walked more streets and canals. As it grew dark, I watched the canals light up and I bought some cheese, hard bread and chips for my journey to Stockholm. Then I walked to Centraal Station and waited an hour for my 19:25 p.m train to Duisberg, Germany. I would have a layover before my train would leave at 22:18 p.m. for Copenhagen, Denmark and arrive at 8:14 AM. I had my supper as I waited for my train to arrive and then it finally came to the platform. I found my couchette, on top and away from the reach of anyone below. It provided me some convenience and security because of its position. I took out my contacts, took off my shoes and covered myself up for a nice long sleep. I actually slept quite well and awoke only one time during the evening. The reason is quite bizarre and serious although looking back it seems funny now. Around 3:30 a.m. at the German-Danish border, German customs agents boarded the train for passport check. They may have been tipped off somewhere in Germany, but they seemed to have been searching for one person — one of the four men in my very own compartment. This particular man was sleeping two bunks below me. They came in and told him in English that he was being arrested because of a false passport. They told him to get his things and brisked him away and off the train. He never said a word in response and cooperated like he knew perfectly well he had been caught. Shortly afterwards, I went back to sleep. What a crazy night!